The economic potential of Myanmar is attracting significant attention. However, some questions have been raised about the reliability of Myanmar's official system of national accounts (MMSNA). First, it is suspected that under the military regime, economic growths might have been significantly overstated since the latter half of the 1990s, by the Economist Intelligence Unit (EIU 2010) and the ADB (2016). The second problem is that until the shift to the managed floating exchange rate system in April 2012, the official exchange rate had been used in the MMSNA in converting international trade into the national currency. Under the official exchange rate, which set the value of the Myanmar kyat at a level far above the market exchange rate, the amounts of exports and imports were significantly undervalued, resulting in a significant underestimation of GDP. The third problem is extensive illegal trade. In recent years, Global Witness (2015a and 2015b) and Dapice et al. (2014) pointed out that illegal exports of jade, whose prices began to surge in the latter half of the 2000s, have not been properly reflected in the MMSNA. According to those recent research findings, the total transaction value of jade is estimated to equate to 48% of Myanmar's GDP in 2014. In a bid to respond to those problems, this paper tries to develop new estimates of GDP. Our results show that Myanmar's real GDP growth turned negative twice, first in 2003–2004 and second in 2007–2008. In terms of the average growth rate for the period 1998–2010, our estimate of 4.9% represents a downward revision of 7.0 percentage points compared with the MMSNA estimate of 11.9%. The downward revision to economic growth in 1998–2010 based on our estimates bring Myanmar's GDP growth and labor productivity growth closer to those of Thailand and Bangladesh. Meanwhile, the impact of revaluing jade transactions on macroeconomic growth is observed from the mid-2000s, for instance, turning negative growth estimated for 2004 before reflecting the reassessed values of jade transactions to positive growth. The impact of revaluation of jade is even more conspicuous in 2008 and thereafter with jade production accounting for more than 10% of Myanmar's GDP. Notably, the revaluation of jade results in a significant upward revision in 2009–2010, from 3.2% to 17.9%. On the other hand, real GDP dropped 21.5% in 2012 as jade production decreased by half following the transfer of power to the civilian government. 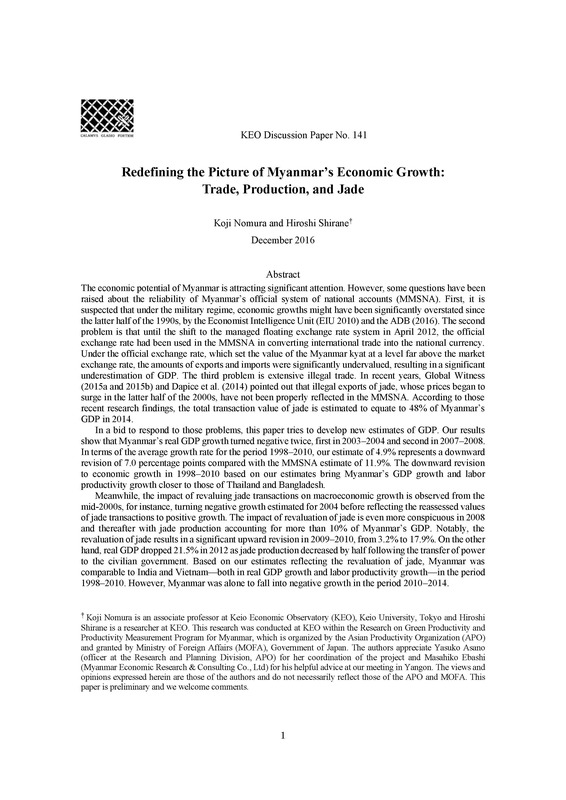 Based on our estimates reflecting the revaluation of jade, Myanmar was comparable to India and Vietnam—both in real GDP growth and labor productivity growth—in the period 1998–2010. However, Myanmar was alone to fall into negative growth in the period 2010–2014.